Their botanical name Diospyros roughy translating to ‘fruit of the gods’ in Greek, so it's no wonder why we can't get enough of persimmons! Whip up this simple recipe and enjoy a zesty side to any and all of your fall platings! Mix all ingredients together in a bowl. Season. Serve at room temperature over a grilled, broiled, baked, poached, or a pan-roasted protein source. Incorporating so many fresh ingredients, there's nothing quite like cooking from your garden. Plant a persimmon tree in your own backyard orchard and enjoy seasonal color and flavor. Adorning the tree like vibrant orange jewels until ripe, bite into a persimmon as sweet as candy. 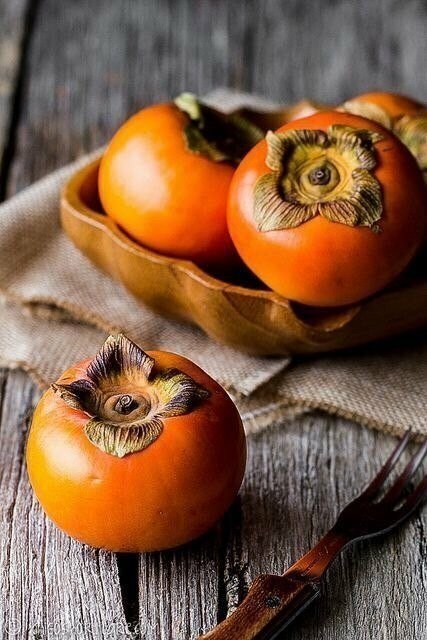 It's easy to identify the difference between Fuyu and Hachiya persimmons; Hachiya are recognized by their acorn-like shape with pointy bottoms while Fuyus are shaped like a flattened tomato. The way you eat them differs as well, Fuyus are eaten like an apple, ripe when firm. On the other hand, Hachiyas are only sweet when ripe, and we're talking even over ripe. The Hachiya persimmon should feel squishy like a water balloon. Cut into the top and enjoy the sweet, gooey texture as a spread on morning toast. In addition to our regular stock, our supplier Dave Wilson Nursery has opened their entire inventory to you. Choose from varieties including Chocolate (bright red skin, brown flesh and a sweet and spicy flavor), Izu (harvests 3 weeks before Fuyu and ready to eat off the tree) and Giant Fuyu (larger and less round with a crisp, crunchy flavor). Orders from the Dave Wilson Fruit Tree List must be prepaid and placed no later than November 5th. Questions? Stop in today and speak with one of our nursery professionals! This recipe is from the Kaiser Permanente website, Food for Health, Recipes for Life.